The book challenges the neofunctionalist and liberal intergovernmentalist perspectives that have been used in the past to explain the process of IGCs. The author presents an alternative perspective in the form of an incremental model to explain the nature of negotiations at all eight constitutional IGCs. It is also argued that the increasing frequency of IGC negotiations signifies a gradual institutionalisation of the process to the point where the constitutional IGC is becoming a regular feature on the EU's political landscape. 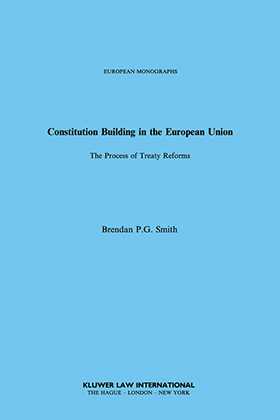 Governments are locked into a process of constitutional IGCs that leaves the primary legal document of the EU in a state of perpetual reform. In turn, it is argued that the incrementalism that defines the IGC negotiations shapes the entire process of European integration and the general nature of the European Union.